Neither pumpkin-flavored nor seasonal, Strawman is one of Angry Orchard’s trio of “Cider House Collection” ciders, meant to be “rare and innovative.” It’s made from “traditional culinary and bittersweet apples” then aged in oak. It’s a cloudy orange, with low fizz, and a bitter, slightly spicy and funky aroma. Tart acid and bitterness dominate the taste, underlaid with a bit of wood and enough sweetness to keep it from being dry. I thought Strawman seemed an overly brash, sharply boozy-tasting cider until I saw that it’s got an ABV of 10%; that explains the alcoholic bite to an extent, though I’d still place it closer to the 12% Prohibition than the comparable 10% Bad Apple. All in all it’s an interesting cider, very aggressive, definitely not something you’d want to drink with sweet or mild foods. At the price point of Strawman (and the rest of the Cider House Collection), you can do better. Instead of buying 750ml of Strawman, you could buy as much or more actual small-batch craft cider that’s just as creative and interesting, from small operations that are probably local to you (wherever you are) and probably could use your business and support more. If you respect the Angry Orchard name and want to drinking something from them that’s a little more interesting than usual, by all means try the Cider House Collection. But folks, I encourage you to check out the smaller outfits in your area and give them a chance. 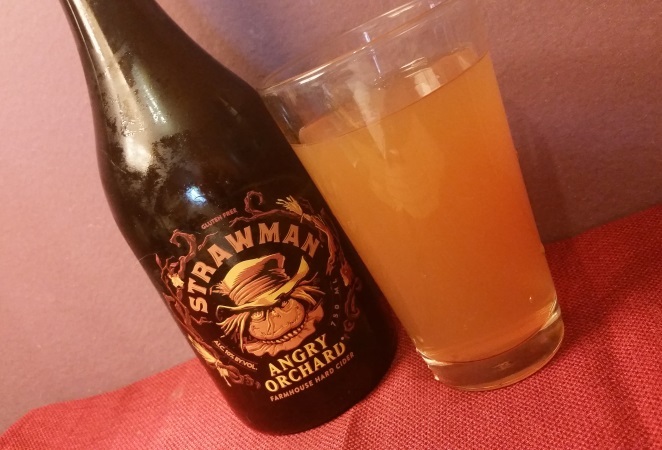 This entry was posted in Cider and tagged angry orchard, cider house collection, cider reviews, strawman. Bookmark the permalink.